There are a number of reasons why industries use 3D surveying when retrofitting facilities. As a facility ages, the need for updates becomes greater to ensure it is equipped to handle evolving developments in technology while providing the data needed to make sound engineering decisions. Conducting a laser scan during the initial process to create a 3D model that will assist in pinpointing the areas that need the most updating, helping focus your resources while saving money. What Is A 3D Survey? A 3D survey is a laser scan that assists in pinpointing as-built areas within a structure or facility to determine the integrity and viability of improvements to make sound, educated decisions. Landpoint’s 3D surveys are used to create models that capture all the data of a structure, converting it into a document that is easy to understand. These models and point clouds help promote the timeliness of a project, cutting down on processes that can be cumbersome and lengthy. How Can 3D Surveying Help My Organization? Knowing your facility and how it operates is key when formulating a plan for upgrades. The existing structure, its measurements, and other areas that may be impacted is key when considering a project of this nature. Utilizing a 3D point cloud will illustrate any project inquires with unequivocal accuracy as the model scales in real-time. Retrofitting oil and gas facilities can be complex. Having the resources and data available to identify potential issues before they occur saves time and money. There are many instances where projects have been delayed due to issues that have surfaced. A 3D model and point cloud helps find these issues in advance to plan ahead and formulate solutions before they are needed. Having an effective plan in place helps to keep the project running on time and on budget. The planning phase is one of the most, if not the only, area that closely evaluates the viability of the project and overall impact of any changes. 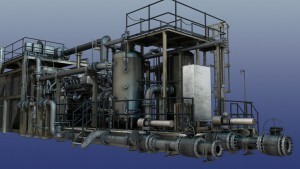 3D models will help in the gathering of data to monitor and develop a successful project. Having a clear picture of what is needed will assist in maintaining the integrity of the project while increasing efficiency and production. A perfect example of how Landpoint used 3D surveying to assist our clients is the Ogilvie Hardware renovation project. This historical structure was scheduled for renovation and slated for structured housing. We scanned the structure and provided detailed models to assist the architects and engineers in retrieving the information they needed to move forward. In total, Landpoint created a historical preservation model, construction support diagrams, a 3D PDF and animated video for the client, which assisted in the redevelopment efforts of this structure, which is now filled with loft apartments. At Landpoint, we take pride in ensuring our clients have what they need to make their projects successful. Models can be created for any industry that needs to determine the integrity of a structure or land mass that is being considered for use. Our team has years of experience, utilizing the best technology available. We can create 3D models and point clouds that can be converted to any format your team needs. We also have the ability to create 3D models from control points, rough drawings, or blueprints when needed. For more information on how 3D surveying and 3D models can enhance your project, contact a team member at Landpoint for a consultation.